Trade fixed-income products without manual intervention - minimize errors. Facilitate the flow of transactions and marketing information to the reps - increase sales. P&L and sales on demand - no waiting for your back office to see how you’re doing. Describe the bonds automatically from KIS or Bloomberg. Route offerings to multiple ATS and platforms. Approve trades automatically or manually. Write and manage trades and tickets. View your trade and offering history for any bond. 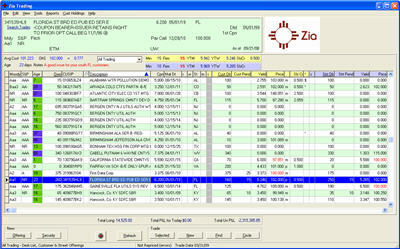 Publish your street offerings real time and receive orders right in Zia Trading ... better offerings; more trades! Interact with the system utilizing a browser and your firm’s intranet. View the offerings… by State (for Munis) or Maturity. Full bond descriptions… Better descriptions = more accurate trades. See the numbers… no more guessing about the accrued interest. Tell the customer about the after tax or taxable equivalent yields. Write a ticket… the system checks availability of inventory at each step in the ticket process, thereby minimizing trade problems. Track your orders… No need to call the desk to check trade approval. View your open orders as well as previous trades. See ‘new items’ only… Print hard copies as needed. Click here for more sales related information. Run reports showing daily transactions. View open orders by Rep/Branch/Region or levels as defined for your firm. Production by rep identifies top performers. 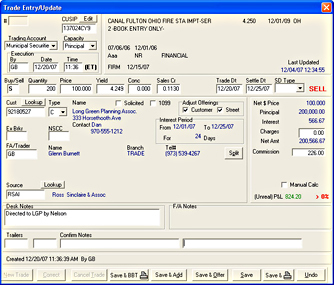 Inventory report shows mark-ups… stay in compliance!